Do you want to know what lies in your future? Well, so did ancient man and this basic human desire led to the creation and discovery, of different methods of fortune telling. Astrology, numerology, I–ching, crystallomancy (reading of a crystal ball), palmistry (cheiromancy), as well as psychic readings may all be different ways of predicting the future, but are all driven by this same desire. In that case, how would one define fortune telling? "Fortune Telling is the practice of predicting the future, usually of an individual, through mystical or supernatural means.". This is what distinguishes predicting the future from say forecasting the weather, one relies on mystical techniques, while the other does not. How do the more popular forms of fortune telling differ? Astrology requires an accurate time, place and date of birth of the concerned person, their name is also of help. From these details, the horoscope chart prevalent at that exact point in time, at that particular location is cast. 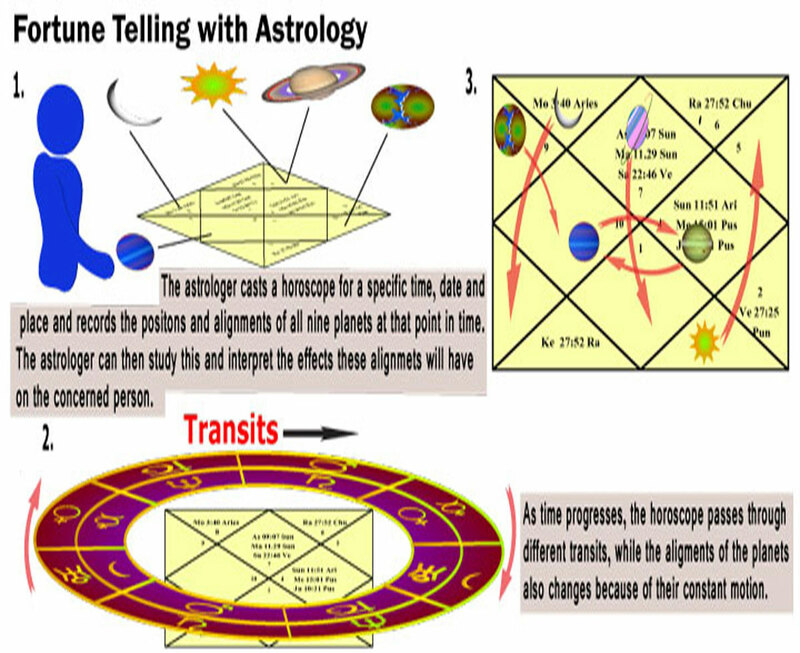 Applying the laws of astrology, allows an astrologer to make predictions about the future depending on the position of different planets, their characteristics and the transits that will pass. According to Vedic mythology, astrology was given to man through divine intervention. The this knowledge was recorded by the sage, 'Maharishi Bhrigu' with the assistance of Venus, who is spiritual guide to all beings of the underworld. These texts, known as, the 'Bhrigu Samhita' contained details of the past and present lives of every soul who walks the earth. This information can still be found today and is in the possession of the protectors of the texts. Many people have been lucky enough to find their details however be advised, today many charlatans also operate in this area, so verify who you're dealing with if you ever go out in search of your own records. Advantages of Astrology: In the right hands astrology can be very accurate, particularly with relation to the timing of events. Also, providing a definitive answers in astrology is usually possible. That is, you should always be able to get a definite ‘Yes’ or ‘No’ to a question and even if the answer cannot be determined, there will be a specific reason as to why this is so. But, in order to make an accurate prediction, exact birth data is almost essential and the questions asked should be as specific as possible. Astrology is not only a means of predicting the future, but can also provide effective remedies to adverse situations. Shortcomings of Astrology: Astrology may not always be suitable for ascertaining minute details, particularly if this relates to someone who is concerned with the querent, but whose horoscope is absent. For example, if someone wants to know the finer details of their future spouse or if they relocate what the exact nature of the new location, astrology may not always be able to provide such details. Astrology is good at predicting events, but may not be able to describe the details of that event. Finding the details to an event depends on the astrologer‘s ability to analyse the meanings of the positions of the planets in a chart and a good astrologer will often employ other predictive methods such as numerology or psychic ability as a guide. Astrology is not a complete knowledge system. The original texts mentioned above, were split up and sent to different parts of ancient India, in order to preserve and protect them. Over the millennia many parts of these texts have been lost and along with it, some portion of our understanding of astrology. Astrology is suitable for: Life's more serious matters, for understanding the past (even past lives), present and future. Astrology also provides solutions, as unfavourable planetary alignments and transits can be rectified with remedies like talismans or gemstones. Analysing the compatibility of two people can be also quite accurately done through astrology, of course the exact birth details of both person is necessary for this. Follow these guidelines for the best results through an astrology reading. Tarot card readings involve the user drawing his or her choice of cards from the pack. The tarot reader is then required to use their psychic ability to interpret card meanings and thus divine the future. Even the most accomplished tarot card readers find it difficult to objectively interpret their own cards and therefore rely on others to make readings for them. Ancient civilizations, have held that all information about the past, present and future is recorded in the very fabric of the Universe. According to Hindu mythology, the 'Akashic Records', which are located in the depths of the Universe, hold this information and this is available for access to anyone with a sufficiently elevated level of consciousness. This may not be as far fetched as it seems. Today, some theoretical quantum physicists suggest that our consciousness maybe made of quantum information that merges with a 'Universal Consciousness' or intelligence, when the body no longer exists. As this eye opening YouTube video explains, if we apply the most recently discovered principles of quantum physics, it is possible to not only describe consciousness and a 'Universal Consciousness', in scientific terms, but also the after life. We'll let you judge for yourself. Advantages of Tarot Cards: Tarot cards are a well rounded form of fortune telling, it can provide accurate details for almost any future event. Unlike astrology, the exact time and place of birth of a person for a reading, but their zodiac sign is required. Shortcomings of Tarot Cards: Again, unlike astrology it is not necessary that the answer to a question will appear in a Tarot reading. There will be be details of future events, but jumbled thoughts can throw up jumbled readings. Making a correct reading depends entirely on how well the Tarot reader interprets the layout, in relation to the question, hence experience is very important. Also, predicting the correct timings of events requires sufficient practice. Tarot Cards are suitable for: Tarot card are suitable for providing accurate details about all major areas of life, even if these may be somewhat trivial.